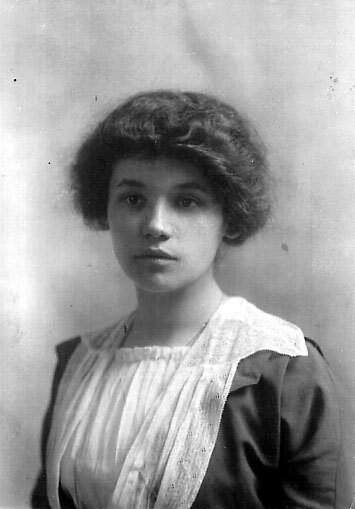 Louise Adams Holland as youthful. Louise Adams Holland as mature women. Courtesy American School of Classical Studies at Athens. Born in New York in 1893, Louise Elizabeth Whetenhall Adams became a philologist, teacher and archaeologist. She graduated from Barnard College in 1914 concentrating in Greek, received her M. A. from Columbia University and her Ph.D. from Byn Mawr College in 1920, where she studied Latin. She attended the American Academy in Rome in 1916-1917, and while there she developed her interest in topography. 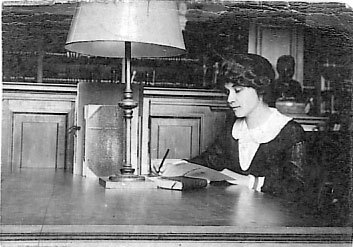 In 1918 she became an instructor at Smith College and in 1921 she was promoted to Assistant Professor of Latin at Smith. In 1923 she married Leicester Bodine Holland and they had a daughter in 1925. Louise and Leicester both taught at Vassar College—she Latin and he Art History. A second daughter was born in 1927 and Leicester was appointed as Chief of the Division of Fine Arts at the Library of Congress, and Louise taught at Bryn Mawr. In 1930 her son was born. World War II Leicester worked for the Office of Strategic Services in Washington and Louise worked for the Midvale Steel Company. With the end of the war she once again taught at Bryn Mawr and returned to Rome with her husband to boat on the Tiber River. In 1948-1949 she received a Guggenheim and thereafter taught at Haverford College and in 1952 she was appointed to teach at Miami University. Her husband died in 1953 and in 1957 she returned to Smith College and taught there until her retirement in 1964. From 1959 to 1960 she had been a resident scholar at the American Academy in Rome, and in 1965 when she left Smith, she was awarded multiple honors including an honorary doctorate from Smith, the Distinguished Alumna Award from Barnard along with many others. During this time she published; Janus and the Bridge was followed by Lucretius and the Transpadanes. Although very close to her family and suffering from macular degeneration, Louise became legally blind, suffered a stroke in 1985 and died in 1990. Keywords: Aegean, Alan J. B. Wace, Alice Hawkins, American Academy in Rome, Alabama, American Philological Association, American School of Classical Studies at Athens, Anésia Araujo, archaeologist, Archaeological Institute of America, A Study of the Commerce of Latium from the Early Iron Age through the Sixth Century A.D., Barnard College, Basque, Barbara Adams, Bert Hodge Hill, Bordeaux, Brindisi, British, Brooklyn, Brooklyn Polytechnic High School, Byn Mawr College, Bryn Mawr Special Traveling Fellow, Carmen Michelena y Rojas, Catullus, C. Dinsmore Curtis, Charles Frederick Adams, Charles Knapp, Charles Upson Clark, Chiusi, Civil War, Columbia University, Cuba, Cumae, Division of Fine Arts at the Library of Congress, D. Doylestown, Electrical Assembly, Emperor Franz Joseph, “Faliscan book”, Forum, Gertrude Hirst, George and Mary Dinmock, Germantown, Germany, Girgenti, “Gisela’s Fifth Century Club”, Goodwin Award, Greek, Guggenheim, Halies, Haverford College, Helen Bacon, Helen Peace, Hellenophile, Henrietta Rozier, Henry Sanders, Iron Age, Janus, Janus and the Bridge, Josephine Truslow Adams, Latin, Lawrence Rozier, Leicester Bodine Holland, Lewis E. McAllister Jr., Josephine Truslow Adams, Lily Ross Taylor, Louise Adams Holland, Lucretius and the Transpadanes, macular degeneration, Maine, Marian Rupert, Mary Swindler, Miami University, Midvale Steel Company, Mt. Soracte, Naples, Nera, New York, Office of Strategic Services in Washington, Paestum, Palermo, Paris, Perry, Pennsylvania, Pierce Hodge Hill, Pompeii, Po River, Orte, Orvieto, Ostia, philologist, Ralph Van Buren, Rome, Salonki, Sarah K. Beach, scarlet fever, Segesta, Shirley Mason, Sicily, Smith College, Smith College Classical Studies, Springgarden Institute, teacher, S. S. Espagne, S. S. Rochambeau, Syracuse, Taormina, Tenny Frank, Tiber River, topography, University of Pennsylvania Museum, University of Pennsylvania School of Architecture, Valentin Müller, Van Deman, Vassar College, Venezuelan, Vergil, Villa Giulia Museum, Virginia, Virginia Jameson, Washington, Wheeler, William Adams, W. J. Schaefer, World War II.